The Vancouver Condo Buzz » Burnaby ALDYNNE on the Park Condo High-Rise by Polygon > Live next to a 222 Acre Central Park Location with Superior Architecture & Features! « From $260,900! THE PARK Metrotown Burnaby Condo High-Rise by Intergulf Development! Incredible Amenities, Location & Interior Finishes! Every time we stroll through Central Park as a family, we’ve wondered what it would be like to be so close to an urban oasis while being just steps away from all the community services and amenities that we so cherish. Central Park Burnaby is one of the most exciting communities in the Lower Mainland, and is often forgotten with all the talk of the redevelopment plans in Metrotown and Brentwood. However, after much time and thought, my family and I have decided to move to the Central Park Burnaby community as our next place to call home. 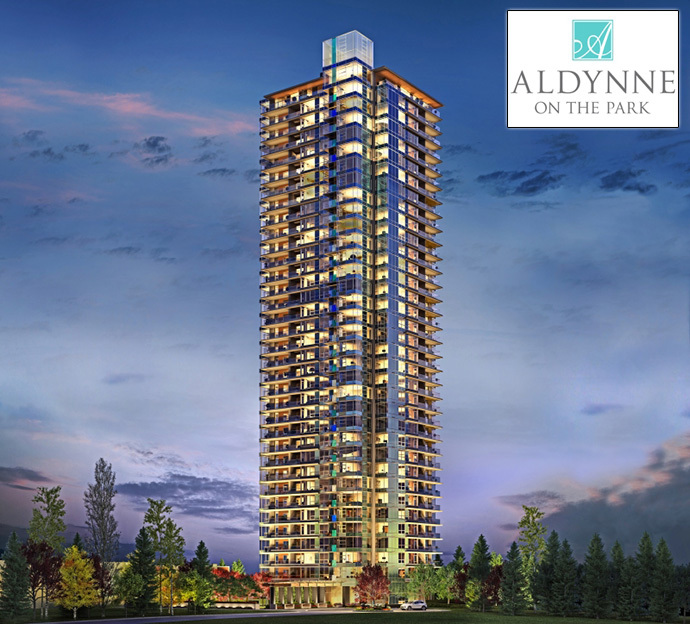 One of the projects that we are most interested in is the new Burnaby Aldynne on the Park condo tower by Polygon Homes, one of the most trusted and established builders in the Greater Vancouver real estate market. The Aldynne on the Park Burnaby Central Park condo high-rise will be designed by acclaimed architects Nigel Baldwin and DYS Architecture and will present elegant and prestigious residences with sophisticated design and architecture throughout both the exterior and interiors. Part of this impressive Polygon Aldynne Burnaby condo development is the fact that this landmark high-rise will be situated next to the 222 acre Central Park Burnaby that offers numerous walking and biking trails, calm reflective ponds, sunny picnic grounds, beautiful perennial gardens and tonnes of recreational options. This includes pitch-and-putt, swimming pool and tennis courts for people of all ages. Home buyers at the Polygon Burnaby Aldynne on the Park condos will enjoy parkside living at its best, but with every urban convenience at your doorstep. The Aldynne Burnaby condos are just minutes away from the local Patterson SkyTrain Station that can get you anywhere in the Lower Mainland. Nearby is Metropolis at Metrotown and lots of big box retailers, boutique stores, restaurants and services like banks and top ranked schools. Enjoy Metrotown Burnaby from a refreshing new perspective. A drive through courtyard welcomes home owners to the Burnaby Central Park condo landmark tower. This courtyard is complemented with a water feature, lush landscaping and coloured glass accent details. In addition the presale Burnaby Aldynne condo tower features an over height lobby entrance with custom metal and glass doors, lighting features and a grand foyer with comfortable seating and a fireplace. On-site will be a resident manager as well as key fob access to the common areas and parkade. There are security proximity readers that protect Aldynne on the Park’s main entry points, parkade entry, lobby and other key locations for extra security and there are also digital recording cameras in the lobby and parkade. The new Burnaby Aldynne by Polygon condos will also feature an elevator with secure lock off control access for each floor, underground parking with lots of bright lighting and emergency alert buttons. Also, all homes come with the 2/5/10 home warranty by Travelers Insurance Company of Canada. The resident only amenities at Aldynne on the Park Burnaby condos will include a fully equipped fitness studio, two electric car plug-in stations, three car wash stations provided throughout the parkade and a multi purpose lounge and entertainment room. There’s also ample underground visitor parking. All homes will be air conditioned for year-round comfort and most Burnaby Aldynne on the Park condos will feature at least 8’6” overheight ceilings in the main living areas. The solid wood entry door is simply beautiful and richly stained and there are 3 designer selected colour schemes for presale homebuyers to choose from including: Light Oak, Dark Pearl and White Pearl. The wood style laminate flooring throughout the living rooms are both durable as well as beautiful. The bedrooms will have plush carpets. The chic kitchens at the presale Burnaby Aldynne condos will feature modern elegance with engineered stone counters and full height marble tiled backsplashes in addition to beautiful illumination with custom lighting (under cabinet and recessed). There are also well designed features that include a built in recycling station, soft close cabinet hardware and under mount double bowl sink in stainless steel with single lever faucet with vegetable spray. The quality stainless steel appliances at the Burnaby Aldynne by Polygon condos will feature a stylish Liebherr fridge with bottom mount freezer (integrated with custom cabinets), Broan hood fan, Panasonic built in microwave, two mount control Energy Star dishwasher by KitchenAid (also fully integrated) and a 30” wide gas cooktop and self cleaning wall oven by KitchenAid. The kitchens will also feature stylish and modern flat panel custom cabinets with polished chrome pulls for the lower cabinets. The designer bathrooms at the Aldynne on the Park Burnaby Central Park condos will include a master ensuite with rich design. Some features include luxurious oversized showers with rain shower heads in most homes as well as convenient dual undermounted sinks, vanity mirrors and recessed lighting. The Polygon Aldynne Burnaby condos will also features second bathrooms with contemporary rectangular soaker tubs with unique polished chrome fixtures in most homes and engineered stone counters and backsplashes. The presale Burnaby Central Park condos will all have stacked washer and dryer for your convenience in addition to future friendly technology. Some special Burnaby Aldynne Penthouse features include a luxurious fireplace with custom designed mantel and accent lighting to highlight artwork. Here are some of the draft floor plans at Aldynne Burnaby condos in no particular order. They are subject to change at any time. Please see a sales staff for more details about availability and pricing. There are many other layouts available, so please visit the Aldynne Burnaby sales centre today for all the details. If you’ve driven by Patterson Avenue in Burnaby, you’ll have noticed our construction team working on the area for our exciting new tower in Burnaby: Aldynne on the Park! Register now to receive exclusive news and updates prior to our official sales opening this summer! http://ow.ly/xj4sd. 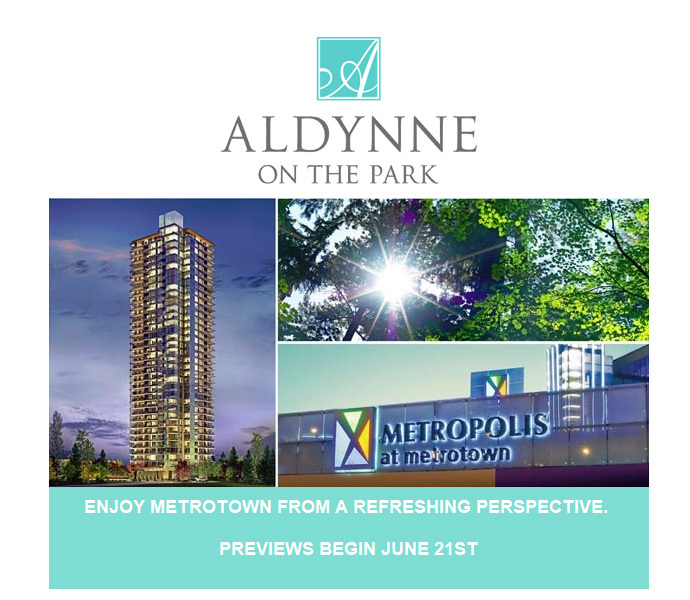 The undeniable allure of Aldynne on the Park by Polygon lies in its unique location overlooking the magnificent 222-acre Central Park and neighbouring the exciting Metropolis at Metrotown mall. With a convenient SkyTrain network just steps from your home, the vibrant Vancouver downtown core is a mere 15 minutes away. This unrivalled proximity to both nature and urban conveniences makes Aldynne on the Park a truly incomparable living experience for your clients who appreciate the finer aspects of life. Our sales program will be commencing soon. Bring your clients to our sales centre for a preview this weekend and receive advance information about this exciting community. We are open starting this Saturday from noon to 6 pm daily (except Friday). Designed by acclaimed architect Nigel Baldwin and DYS Architecture, Aldynne on the Park evokes a sophisticated character through its meticulous use of harmonious colours and natural elements. Inside, the air-conditioned residences are generously scaled, beautifully appointed and built to Polygon’s tradition of rigorous standards, combining inviting comfort with captivating floor-to-ceiling views of green spaces and cityscape. Our sales program is scheduled to commence this summer.